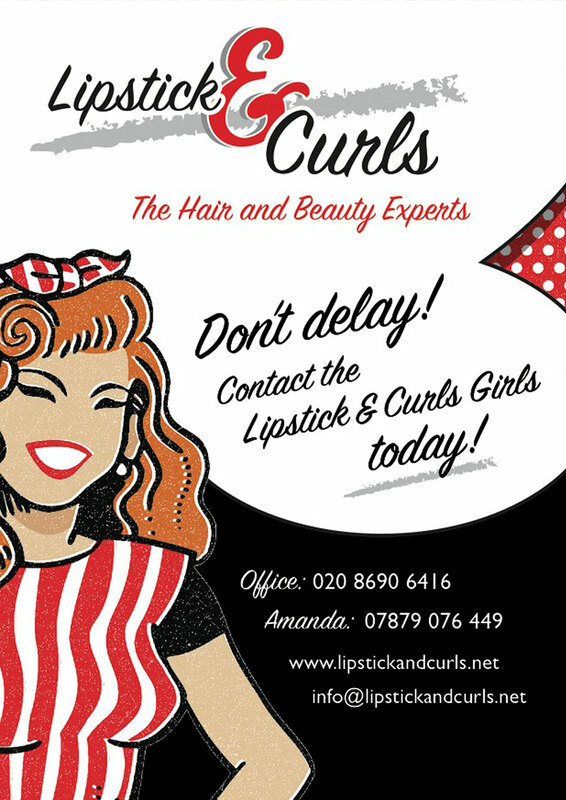 Just outside of London there is hidden gem of a place, a tearoom with a difference. Amidst the faceless concrete of high-street stores and fast-food restaurants sits Vintage Lindy Lou’s. This is not your average tearoom, you won’t find ‘distressed’ furniture or white ‘shabby chic’ tables and chairs here. This tearoom was created to encapsulate a bygone era, to become a part of the community and to provide a historical snapshot of life. When she began to realise her tearoom dream, Linda had already amassed a huge collection of crockery and home-ware. She then set about finding furniture from antique fairs, charity shops and the like. Carefully chosen pieces that would be in keeping with the 1940s front room feel. Authentic tables and chairs with all of the knocks and quirks that tell the story from their previous lives in someone else’s home. tearoom feel so different. This isn’t the only dress displayed. 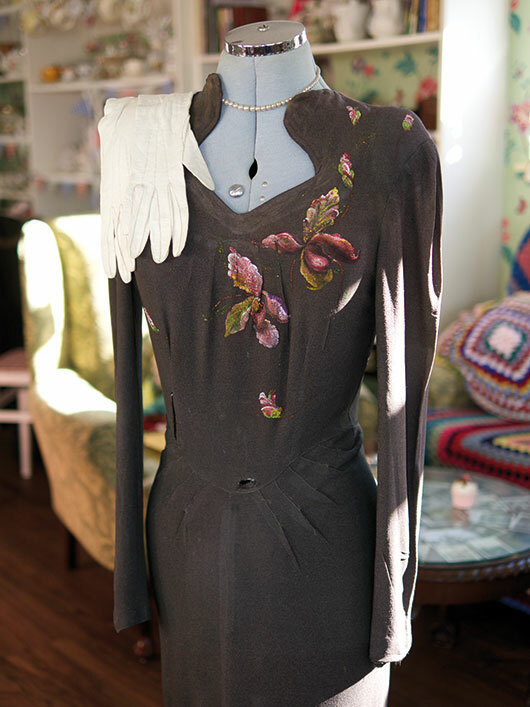 A stunning moss green dress with hand-painted flowers stands on a dressmaker’s mannequin near the window, complete with little white gloves. This outfit was made by Linda’s mother in the year she was awaiting transportation from Italy to the UK. She had married Linda’s dad in 1947 in Trieste, Italy but had to wait to be brought over to England. She wanted to make a special dress for when she met her new husband but because she couldn’t find material ‘pretty enough’ she decided to hand paint on orchids. 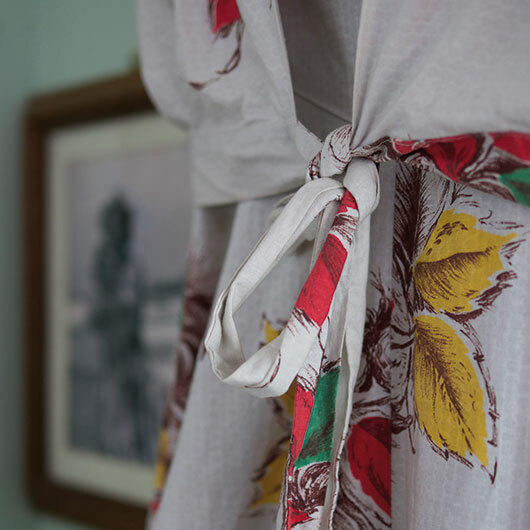 She wore this dress when she alighted from her train at Paddington in 1948 and then into the arms of her husband. This was the beginning of 61 years of marriage and the start of Linda’s family. 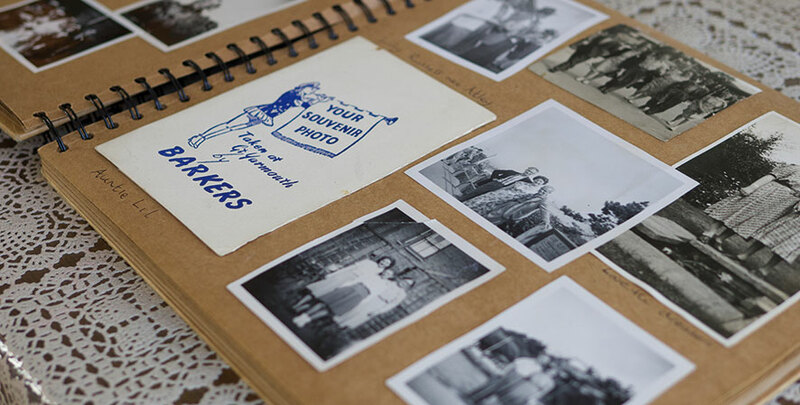 A wall of wedding photos tell the story of loves past, and present, friends or customers who have wanted to share their history with this special place. Many of the older residents of the area come in, often alone, to chat to Linda and her staff about their lives and experiences. Linda wanted to have “something tangible, that evokes a memory, this was originally a box which turned into a folder and then into the Memories Book”. Linda often ‘friend match-makes’ by sitting one single person on a table with another. Within a short space of time they are chatting and reminiscing like old companions. Linda tells me that she tries not to reserve her two largest tables and instead has created ‘sharing tables’ in which people do just that. One regular is a five year old boy (and his mum) who loves having ‘tea’ with his own tea set and at the opposite end of life, a 100 year old man has reserved a table for his birthday next week. 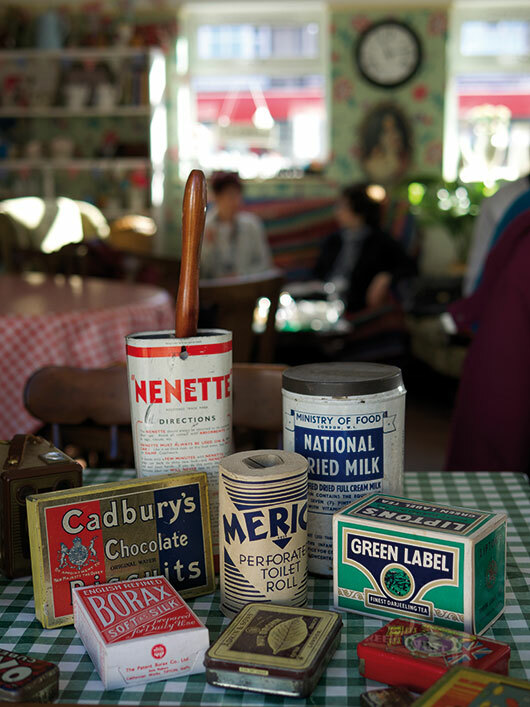 Vintage Lindy Lou’s is unique because it recognises that the history of a place is made by communities, families and friends. It is lived out through the everyday furniture, clothing and homeware. 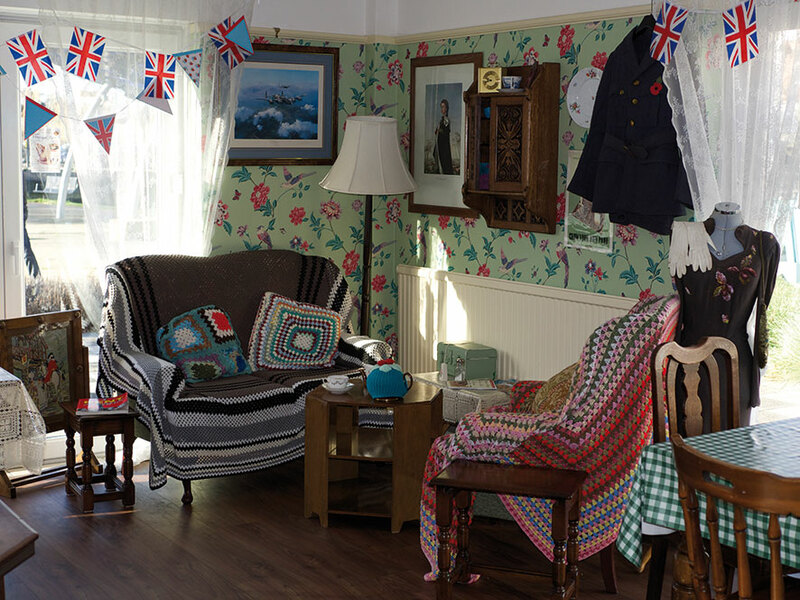 When you enter the tearoom you can see the appreciation of bygone eras and the respect for ordinary people and how they lived their lives. Linda wanted more than a place for people to drink tea and eat cake. She wanted to make an impact on her local community, she wanted to bring her love of vintage pieces to others and she has shared not only her passion, but her own family history. The tea room is personal, not least shown in the name Lindy Lou, a nickname given to her by her late father. 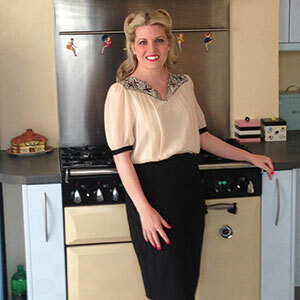 Binty Bun is a primary school teacher with one foot firmly in the past. She is an avid collector of vintage pieces, filling her home with mid-century treasures and her wardrobe with 40s and 50s delights.